Surgery continues to evolve as new technology, techniques, and knowledge are incorporated into the care of surgical patients. Safety is paramount in care of our surgical patients. We have included a new chapter in this edition of Sabiston Textbook of Surgery about our roles and responsibilities to ensure safety. Surgeons, traditional leaders in mass casualty situations, face new problems and challenges in the era of bioterrorism. Distant surgery, employing robotic and telementoring technology, has become a reality. Minimally invasive techniques are being employed in almost all invasive procedures. Increased understanding of molecular genetic abnormalities has expanded the application of preemptive surgical operations to prevent cancer. The 18th edition of the Sabiston Textbook of Surgery reflects these exciting changes and new knowledge. We have incorporated 3 new chapters and more than 50 new authors to ensure that the most current information is presented. The goal of this new edition is to remain the most thorough, useful, readable, and understandable textbook presenting the principles and techniques of surgery. It is designed to be equally useful to students, trainees, and experts in the field. We are committed to maintaining this tradition of excellence begun in 1936. Surgery, after all, remains a discipline in which the knowledge and skill of a surgeon combine for the welfare of our patients. Current Therapy of Trauma has become the leading text for trauma management. Current Therapy of Trauma and Surgical Criti- cal Care, a new volume in the Current Therapy series, builds on the infrastructure and credibility of the four previous volumes of Cur- rent Therapy of Trauma, and it includes critical care and aspects of rehabilitation as well. With these additions, Dr. Juan A. Asensio and Dr. Donald D. Trunkey now cover the full continuum of care— prevention, injury, prehospital treatment, triage, diagnosis, injury management, and postoperative care. The social consequences of trauma have been emphasized since the first edition of Current Therapy of Trauma. Unfortunately, traumatic injury is still the lead- ing cause of lost years of productive life, surpassing cardiac disease, cancer, and stroke. However, no one young or old is immune to this disease. The ubiquitous, dramatic, and immediate nature of this medical malady means that this book will be valuable for many health care professionals, including emergency physicians, intensiv- ists, residents, medical students, nurses, fire–rescue personnel—and not just surgeons. Leading specialists who have busy clinical practices are the authors of the chapters, and they have contributed to this book be- cause of its stature in the field of trauma care. Their emphasis has been on a practical approach to clinical problems following the principles of evidence-based medicine. Controversies are addressed, but the focus is on preferred treatment approaches. The evolving field of nonoperative management of blunt and penetrating trauma is critically reviewed and updated. The section on critical care is valu- able and comprehensive in scope, but not overwhelming. There are even chapters on special issues, including trauma at the extremes of life and in pregnancy, palliative care in the intensive care unit, and management of grief. Trauma and critical care have undergone rapid growth and maturation. The lessons taught in this book can be applied by every- one who treats trauma victims, and no one interested in their man- agement could read it and not come away better prepared to take care of these patients. 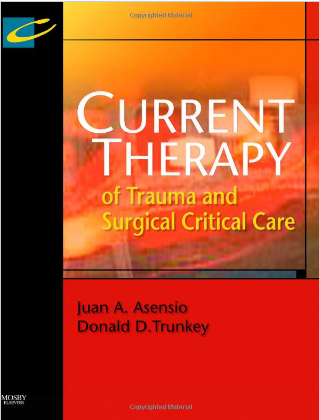 Dr. Trunkey has been one of the forces behind the Current Therapy of Trauma reference text since its inception, and the addition of Dr. Asensio represents a symbolic passing of the torch to the next generation of trauma surgeons dedicated to making a difference in this devastating and costly disease. 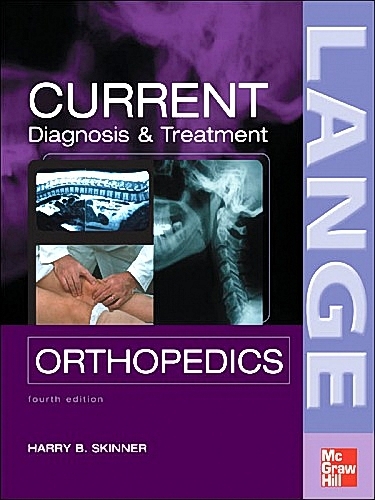 The best clinically-focused, mid-sized reference covering the evaluation, management, and treatment of common orthopedic conditions. Emphasizes the impact of changes in imaging technology on the optimal approach to diagnosis and treatment. Includes a concise review of the basic science underlying current orthopedic surgery practice. Features more than 500 illustrations, an easy-access format, and a valuable chapter on orthopedic surgery in children. The fifth edition of this successful title for surgical trainees gives clear, concise guidance on all aspects of acquiring surgical skills to ensure operative success. The full range of surgical procedures is comprehensively reviewed in a clear "how-to-do-it" style, which consolidates the skills learnt in theatre. The new edition has been thoroughly updated throughout, with new, additional information on laparoscopic procedures and minimal access surgery. Each chapter is now introduced with a key points box, which briefly summarises the key issues that are covered. In addition, over 25% of the original illustrations have been replaced with clear, new drawings. Finally, for the first time experts have reviewed and addeed their comments to each chapter. When we refer to a work of art, music, or literature as a ‘‘classic’’, one of the observations that we make is that the work has stimulated a wide variety of treatments and interpretations. Imitation is, of course, the most visible and credible form of flattery. When Charlie Abernathy initially assaulted our surgical clinical comfort zone with a barrage of questions neither he, nor we, predicted that his irritating efforts would spawn a whole ‘‘Secrets Series’’ of challenging Abernathyisms in almost all medical disciplines. But, characteristically, Charlie had his fingers capably placed on the pulse of progress. Casey Stengel famously noted: ‘‘In baseball, more games are lost than won.’’ If you are not investi- gating, learning, or questioning, you are losing. In medicine, and certainly surgery, you cannot stand still. Alfred North Whitehead, the U.S. philosopher, observed: ‘‘No man of science could subscribe without qualification . . . to all of his own scientific beliefs of ten years ago.’’ We must be flexible, to evolve, to question. Happily, surgeons are almost unique in our ability to be self- critical. We must never march, like a legion of lemmings, into a sea of intellectual acceptance. This sixth edition of Surgical Secrets is again dedicated to Abernathy’s irritatingly penetrating series of questions. Charlie never took much stock in the ponderously traditional answer. Intellectually active surgeons should never get too comfortable. Challenging dogma is good; comfort is bad. Dinosaurs were inflexible and are extinct. Surgeons will never be either. This second edition has extended its range from being primarily intended for undergraduate med- ical students to include pre-registration house officers (PRHOs). New doctors, general practition- ers (especially teachers) and other health profes- sionals will find it useful. As a medical student 30 years ago, I was very keen to meet patients and experience the full range of conditions that I would face as a medical practitioner. I was also aware that my time as an undergraduate was limited. It was therefore important for me to gather a kernel of knowledge, skills and appropri- ate attitudes that would take me through my final examinations into my house officer years with sufficient substance to allow me to be a good and safe-enough doctor. However, at that time, either in the way that I perceived it or in the way that it was presented to me, general practice seemed to be such a vast and loosely determined discipline as to be too difficult to be used in this process. On the other hand, it also appeared to have all the dimensions and potential that I needed to explore the realms of health, illness and healing to my heart’s content. Now, as a teacher and practi- tioner of general practice, I have been able to revisit the discipline from a new perspective and in a much more productive way. Approximately 20% of all surgical operations and a similar percentage of surgical emergencies are urological in nature. However, doctors often have very limited experience with the many common and varied conditions encountered in this important surgical specialty. For the doctor or nurse expected to provide the initial assessment and management of a condition with which he or she has had very limited experience, this book provides an invaluable source of information and advice. This applies not only to SHOs and specialist registrars on urology and surgical rotations, but also to General Practitioners, Accident and Emergency staff, and the growing number of urological specialist nurses. The overall structure of this handbook is similar to that of the British National Formulary; it is arranged broadly by therapeutic category. When a drug has several different uses, these are brought together in a single article (e.g. lidocaine is used as an antiarrhythmic drug and as a local anaesthetic); this will allow the reader to appreciate its full range of actions, whether therapeutic or adverse. This is not a textbook of pharmacology, but the safe and effective use of medicines requires a sound knowledge of pharmacology. When a drug illustrates a particular pharmacological principle, this is expanded on in the â€˜teaching pointâ€™ section at the end of an article. As readers use the book, they will increase their basic knowledge in this practical way. A â€˜cookbookâ€™ approach to drug therapy is inappropriate, since each prescription constitutes an individual experiment in that patient. However, the text includes boxes giving guidance on the approach to therapy of specific diseases and clinical problems (e.g. the treatment of gout and the symptomatic treatment of vomiting). In some cases, algorithms for the treatment of clinical emergencies are also given (e.g. hypoglycaemia, cardiac arrest). This handbook provides a wealth of simple and easy to follow information on sexually transmitted infections (STIs), human immunodeficiency virus (HIV), other genitourinary conditions, and the principles to provide a safe, high-quality service. Although designed for the trainee and practitioner in the UK it is envisaged that it will be of global use to all those with an interest in sexual health whatever their level of expertise and wherever they may practice. The book provides comprehensive practical guidance on genitourinary medicine (GUM), and includes HIV infection in the adult. STIs and related genitourinary problems together with other areas of practical relevance are also covered (e.g. practice within GUM, medico-legal/ethical issues and frequently asked questions). The continuing rise of STIs has resulted in an extended workforce. This includes the creation of specialist nurses and primary healthcare teams with extended roles. It is intended that the information contained should address their needs as well as the specialist practitioner. The contents start with service development and administration proceeding to medico-legal and ethical issues, routine patient management and flow charts detailing common clinical situations. This is followed by a series of chapters describing STIs and other problems commonly presenting to GUM in a disease-orientated style. Chapters on HIV infection and the acquired immunodeficiency syndrome (AIDS) follow including an epidemiological overview, basic viral biology, and pathogenesis before proceeding to systematic description of conditions both directly related and opportunistic, their management and concluding with special situations (pregnancy and travel). Commonly used abbreviations are summarized and some useful resources provided. This is the second edition of the Oxford Handbook of General Practiceâ€” so what's changed? When we wrote the first edition, we spent many long hours debating what to include and what to exclude. It wasn't an easy task, as general practice has no boundaries and, inevitably, we excluded topics we should have included and vice versa. In this edition, we have updated the first edition material: we have completely rewritten the general practice section to include the new GP contract and updated clinical topics in line with new national and international guidelines. As a result of feedback from readers, we have tried to make the text clearer and more evidence-based. We have also included several new topics such as complementary medicine, elderly care, and chronic disease management, as well as expanding some of the preexisting sections. We have lost two of our authors. Jon Birtwistle has moved to a new post and no longer works in general practice. Brian Stevenson has retired and is enjoying life to the full travelling the world. In their place, we have gained Tony Kendrick, Professor of Primary Care at Southampton University, as a guest author for this edition. He has a special interest in mental health problems in primary care and has considerably updated that section in this edition, as well as providing invaluable feedback on many other sections. The fully revised, third edition of this bestselling handbook describes best practice of critical care in a succint, concise, and clinically-oriented way. Covering the principles of general management, it includes therapeutic and monitoring devices, specific disorders of organ systems, as well as detailed information on drugs and fluids. New material has been added on key areas such as airway maintenance, dressing techniques, infection control, echocardiography, tissue perfusion monitoring, coma and more. With up-to-date references and invaluable clinical advice, there is also plenty of space to add notes or amend sections to suit local protocols. Patient-centered and practical, it will serve the consultant, trainee, nurse or other allied health professionals as both a reference and aide memoir. This is the indispensable Oxford Handbook for all those working within critical care. This, the third edition of the Oxford Handbook of Clinical Surgery, reflects the changes which have occurred in general surgery over the seventeen years since the first edition was published. Firstly, we have recruited the services of two new editors, a stark contrast to the original which was written by a single author with the assistance of a Surgical Registrar. Secondly, each chapter has been written by a Specialist Consultant or Registrar in the subject and, therefore, presents a modern, state-of-the-art treatise on each topic. Again, each condition is covered in the original two-page format with blank pages for accompanying notes. I am particularly grateful for the commitment that Jo Chikwe and Neil Borley have made, and also wish to thank staff at Oxford University Press for their support and patience. I am also grateful for the contribution and support given by many colleagues, and wish particularly to thank Anneli Thornton for her diligent preparation of the manuscript. With the increasing complexity of modern medicine, we now have literally thousands of possible investigative techniques at our disposal. We are able to examine our patient’s serum and every other body fluid down to the level of individual nucleotides, as well as being able to perform precise imaging through CT, MRI and other imaging technologies. The problem we have all faced, especially as senior medical students or junior doctors is: which test should we use in a given setting? What hazards are associated with the tests? Are there any situations where specific tests should not be used or are likely to produce erroneous results? As medical complexity increases so too does cost; many assays available today are highly expen- sive and wherever possible we would ideally like to use a test which is cheap, reliable, reproducible and right for a given situation. Such knowledge takes many years to acquire and it is a fact of life that senior doctors (who have attained such knowledge) are not usually those who request the investigations. In this small volume, we have attempted to distil all that is known about modern tests, from blood, urine and other body fluids, along with imaging and molecular tests. The book is divided into two principal parts: the first deals with symptoms and signs in The patient section, because that is how patients present. We have tried to cover as many topics as possible, discussing these in some detail and have provided differential diagnoses where possible. We also try to suggest tests that might be of value in determining the cause of the patient’s symptom or sign. The second part of the book, Investigations, is spe- cialty-specific, and is more relevant once you know roughly what type of disease the patient might have. For example, if the symptom section sug- gests a likely respiratory cause for the patient’s symptoms, then the reader should look to the Respiratory investigations chapter in order to determine which tests to carry out, or how to interpret the results. The entire book is written by active clinicians, rather than scientists, since we wanted to provide a strong clinical approach to investigation. We have tried, wherever possible, to cross-refer to the Oxford Handbook of Clinical Medicine, 5th edition, Oxford University Press, which provides the clinical detail omitted from this handbook. The symbol␣is used to highlight a cross-reference to OHCM, in addition to cross-referencing within this book. We would value feedback from readers since there will doubtless be tests omitted, errors in the text and many other improvements we could, and will, make in future editions. All contributors will be acknowledged individually in the next edition. We would suggest you e-mail us directly: a.provan@virgin.net. Senior House Officer - Queen's Medical Centre, Nottingham, UK. Academic Clinical Fellow, Wolfson Digestive Diseases Centre, University of Nottingham, Nottingham, UK. There are very few people who, in the course of their daily work, can approach a stranger, ask them to remove their clothes, and touch their bodies without fear of admonition. This unique position of doctors, medical students, and other health care professionals comes with many strings attached. We are expected to act â€˜professionallyâ€™ and be competent and confident in all our dealings. This is hard to teach and hard to learn and many students are rightly daunted by the new position in which they find themselves. We felt a little let down by many books during our time in medical school, and often found ourselves having to dip into several texts to appreciate a topic. This book, then, is the one text that we would have wanted as students covering all the main medical and surgical subspecialties. We anticipate it will be useful to students as they make the transition to being a doctor and also to junior doctors. We hope that it will be carried in coat pockets for quick glances as well as being suitable for study at home or in the library. The first three chapters cover the basics of communication skills, history taking and general physical examination. Chapters 4,5,6,7,8,9,10,11,12,13 and 14 are divided by systems. In each of these there is a section on the common symptoms seen in that system, with the appropriate questions to ask the patient, details of how to examine parts of that system, and important patterns of disease presentation. Each of these system chapters is finished off with an â€˜elderly patientâ€™ page provided by Dr Richard Fuller. Following the systems, there are chapters on paediatric and psychiatric patientsâ€”something not found in many other books of this kind. The penultimate chapterâ€”practical proceduresâ€”details all those tasks that junior doctors might be expected to perform. Finally, there is an extensive â€˜data interpretationâ€™ chapter which, whilst not exhaustive, tries to cover those topics such as ECG, ABG, and X-ray interpretation that may appear in a final â€˜OSCEâ€™ examination. Although we have consulted experts on the contents of each chapter, any mistakes or omissions remain ours alone. We welcome any comments and suggestions for improvement from our readerâ€”this book, after all, is for you. In this third edition of Surgical Anatomy and Technique: A Pocket Manual, we are very pleased to add three new chapters: the vascular system by Drs. Deepak G. Nair and Robert B. Smith III; the uterus, ovaries, and tubes by Dr. Ramon A. Suarez; and microsurgical techniques by Drs. John G. Seiler III and Petros Mirilas. Drs. Seth D. Force and Daniel L. Miller revised several procedures in the chapter on the esophagus. In the section on hemorrhoidectomies, Dr. Joseph J. Nichols, Jr., provided techniques for stapled hemorrhoidectomy and band ligation. Procedures for laparoscopic left colectomy including sigmoid colectomy and for laparoscopic-assisted right colectomy were added by Dr. Jay Singh in collaboration with Dr. Lee Skandalakis. As in preceding editions we continue to present only basic (“nuts and bolts”) surgical techniques, not advanced procedures such as transplantation and robotics, because we are committed to maintaining this book as a “pocket manual.” We hope that the several chapters we reorganized are now easier to use. We want to mention that the sutures specifi ed in the text are those preferred by the authors, but comparable sutures can be used at the surgeon’s discretion. My co-authors and I greatly appreciate the support we have received from Springer and the confi dence Springer has had in Surgical Anatomy and Technique : A Pocket Manual. The book has been translated into eight languages in addition to being distributed throughout the world in English. We are grateful, also, to the anatomists, surgeons, and by all means, the students for their warm acceptance of this book. In my peripatetic life of lecturing I have found that signing the book for students eager to learn about surgical anatomy is an emotional and heart-warming experience—even to “a lion’s heart”—and sometimes even brings tears to my eyes. As I wrote recently in a letter published in the Bulletin of the American College of Surgeons (BACS 2006;91:48): I believe it’s time the pendulum shifted back to teaching our students the fundamentals of gross human anatomy and instilling a solid foundation on which to build. After all, surgeons can and will make many unnecessary and fatal accidents if they don’t know surgical anatomy. The reader will notice that in this edition my son, Lee, has taken the helm as the senior author, since I am now passing through the springtime of my senility. I am proud and grateful that he is continuing this work. Much of the diagnosis of ocular disease is based on the accurate observation and correct interpretation of clinical signs. The main purpose of this book is to acquaint the reader with the salient characteristics, causes and differential diagnosis of the many signs that may occur in ophthalmic disorders. The last chapter is devoted to systemic signs that may occur in diseases that have ophthalmic manifestations. Where appropriate, special investigations such as fluorescein angiography and MR are also included. The text is concise yet comprehensive and key colour-coded information is used to help the reader to navigate through each section. This book should be of particular interest to ophthalmologists in training and optometrists.